Turn your outdoor space into a relaxing retreat with the Serta Tahoe Outdoor Sofa. Inspired by luxury outdoor furniture designs, the Serta Tahoe Outdoor Collection features a low profile and gracefully sloped back and arms for a touch of elegance. And the thick comfortable cushions will make your patio, deck or veranda feel like a five-star resort. 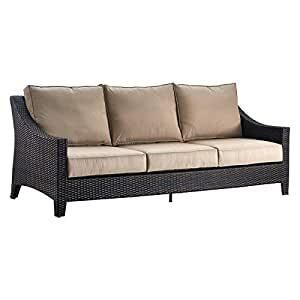 The Tahoe Outdoor Furniture Collection from Serta is ideal for lounging in the sun, but can stand up to all seasons with durable resin wicker and quick-drying olefin fabric.